For decades, Sister Wardeh Kayrouz has been a voice for the voiceless — offering hope and help to countless refugees seeking sanctuary. She began her long relationship with CNEWA working in our Amman regional office. Today, she continues to partner with CNEWA in Lebanon, aiding so many who are fleeing violence, terror and war. Sister Wardeh and her community, the Franciscan Missionaries of Mary, have dedicated their lives to helping families secure food, housing, work and other basics. In 2002 the sisters stepped up their efforts and forged a partnership with CNEWA’s operating agency in the Middle East, the Pontifical Mission. An energetic woman with large, round wire-rimmed spectacles, she counsels a growing number of Iraqi families, administers a convent school and teaches catechism classes. “When they live the word of God, they strengthen their faith, helping them better handle the bad situations they have here,” Sister Wardeh said. ...A social worker by training, Sister Wardeh counsels families struggling with domestic violence and the pain associated with it. Families have come to trust her and rely on her for guidance. She often finds herself at their homes, listening to their fears, holding their hands and helping them cope with their situations. “Poverty brings out every type of problem between children and their parents. They have no money to go anywhere or do anything. There is no work. Women and their husbands argue over whether they should have left Iraq. They are home all day long, all the time,” Sister Wardeh said. It was her own experience with war in Lebanon that led her to her vocation. Born and reared in the town of Bcharri, the legendary mountainous stronghold of Lebanon’s Maronite Catholics, she completed a degree in sociology and became a teacher and a principal in her village. In 1976, just as Lebanon’s civil war set in, Bcharri became a flash point for fighting between Maronite and Palestinian militias. During the war she met a religious sister named Beatrice who transported the dead and wounded with her car. “Sister Beatrice used to say, ‘It is not I who am doing this, but God is doing it through me,’ and I was greatly affected by this.” Sister Wardeh eventually took her vows at age 27. “My family lost everything in the war,” she says. “My father and mother used to pray and they came back to the church and were able to cope with their loss and move on with their lives. To lend your support to the heroic work of Sister Wardeh and others in Jordan, visit this giving page. School food programs in Ethiopia provide students with nutritionally dense biscuits daily. Most of my visit was concentrated in the extreme northern reaches of the country bordering Eritrea. This is a vast mountainous area that has very challenging “roads” to reach remote villages; in many instances there are no roads at all, only dangerous mountain footpaths. After a tortuous two-hour, nail-biting trip in a four-wheel-drive vehicle, our director of programs, Thomas Varghese, and I arrived in a remote village named Aiga, where we stopped at the humble parish school of St. Michael. There, the children warmly greeted us with songs and prayers and welcomed us lovingly into their classrooms, which have only the barest hint of outside natural light for the classes. After visiting with each of the classes, we went outside the school, where they lined up to receive their “CNEWA” biscuits: a two-biscuit pack that would sustain them as the school day went on and would give them enough energy to walk home to their mountain dwellings. Most of the children walked over steep mountain trails for two or three hours each way to come to school. This simple nutritional supplement means the difference between these beautiful children coming to school or staying at home. There were two very touching moments for me as they were enjoying their biscuits. The first came when I saw many children only eating one biscuit and wrapping up the other one to take home to be shared with others in their family; and the second was when a little girl offered me one of her biscuits. Tears came to my eyes at this gesture of kindness and generosity. What a demonstration of the Christian values that they learn in school and practice in their humble homes. Read more in the magazine. And watch the video below for more of Msgr. Kozar’s impressions from that trip. If you’d like to support CNEWA’s work in Ethiopia, and help the hungry hold on to life, visit this giving page. During a time of turmoil and violence in his homeland, Lebanon’s Bechara Peter Cardinal Rai — Maronite Catholic Patriarch of Antioch — has been a heroic voice calling for reconciliation. It was a subject he addressed during his visit to CNEWA yesterday, and it’s one he’s made a hallmark of his ministry to the people of Lebanon. He was enthroned as Patriarch of Antioch and all the East on 25 March 2011, the Feast of the Annunciation. Fittingly, his name “Bechara” means “annunciation.” That day, he served as a kind of herald to the people of Lebanon, both Christian and Muslim, announcing a message of “communion and love,” the very words he chose for his patriarchal motto. For the sake of “communion and love” we work together in the countries of the Middle East and with you the representatives of the leaders of our brother and sister countries, and we work to preserve and strengthen our relations of solidarity with the Arab world, and to establish a sincere and complete dialogue with our Muslim brothers and sisters and build together a future in common life and cooperation. For one single destiny links Muslims and Christians in Lebanon and the countries of the region in which, a culture particular to all of us, was built up by the diverse civilizations which passed one after another in our lands and thus we have a common patrimony in which we all shared in its creation and now work at its cultural development. We accompany with anxiety the uprisings and protests which are taking place here and there in our Arab countries. We regret the victims and the wounded and we pray for stability and peace. As an emissary of hope and healing in the world CNEWA serves, the patriarch has been a great supporter of our shared mission to uplift those who are suffering and to accompany those in need. In Lebanon today, that includes an overwhelming number of refugees, many fleeing war and terror in Iraq and Syria; they now make up roughly half the country’s population. To assist the patriarch and support the work of CNEWA in Lebanon, visit this page. “More than the beauty found in the Vatican Gardens, your goodness is the place where I live; I feel protected,” Pope Benedict said 28 June. Pope Francis led a Vatican celebration for the 65th anniversary of Pope Benedict’s priestly ordination. The two were joined by the heads of Vatican offices and congregations and several guests, including a delegation from the Orthodox Ecumenical Patriarchate of Constantinople. Those gathered gave Pope Benedict a standing ovation as he made his way into the Clementine Hall and took his seat to the right of the pope’s chair. For more, check out the CNS video of the event and the remarks below. Lebanon’s northeastern village of Al Qaa, a Lebanese Christian village, was in a state of alert Tuesday as security forces expanded search operations after eight suicide bombers attacked the village yesterday — Monday, 27 June 2016. The bombers killed five and wounded over 30 people in the latest violent spillover of the five-year-old Syrian war into Lebanon. A first wave of attacks involved four suicide bombers who struck after 4 a.m., killing five people, all civilians. The first bomber blew himself up after being confronted by a resident, with the other three detonating their bombs one after the other as people arrived at the scene. A second series of attacks, involving at least four assailants, took place in the evening. Two of the bombers arrived on motorcycles, hurled explosives and then blew themselves up outside Mar Elias Melkite Greek Catholic Church — which has received support from CNEWA — as residents were preparing the funerals of those killed earlier. Security sources said they believed Islamic State was responsible for the bombings but there was no immediate claim of responsibility. These events have revived fears of a return to the violence that had targeted the Lebanese army and Hezbollah areas in the past.Lebanon has been repeatedly jolted by militant attacks linked to the war in neighboring Syria. The last suicide attack to rock Lebanon was on 12 November 2015, when two suicide bombers blew themselves up on a busy street in the Burj al Barajneh neighborhood of Beirut’s southern suburbs, killing 47 people and wounding over 200 others. The attack was claimed by ISIS. Local TV footage showed yesterday Al Qaa’s residents holding rifles calling on the government to support the Christian village in defending itself as hundreds of ISIS militants are holed up on the eastern outskirts of the town. ISIS hopes to force Christian community to leave the village; by controlling Al Qaa, the fanatic militants will be able to create a corridor to the Mediterranean, as the Lebanese Army explained in a communiqué earlier. ISIS had urged its followers to launch attacks on “nonbelievers” during the Islamic holy month of Ramadan, which began in early June. The area of Masharih al Qaa — a predominantly Sunni area near Al Qaa — is home to a large number of refugees who have fled the war in Syria. Al Qaa is located about 30 miles north of the city of Baalbek, where Hezbollah holds sway, and about 90 miles from Beirut. It is a Christian village of 15,000 residents, mainly Melkite Greek Catholics — under the jurisdiction of the Melkite Greek Catholic bishop of Baalbek — situated several miles north of Ras Baalbek, next to the eastern border with Syria’s Homs district, in the Hermel area. Al Qaa and Ras Baalbek are the only two villages with a Christian majority in the predominantly Shiite region, where Hezbollah enjoys wide support. For decades, this rural agrarian village has been lagging behind the rest of the country, having received less assistance from either the government of Lebanon or local NGOs. Consequently, it suffers from a high rate of poverty, limited economic and educational opportunities and dire health conditions. Around 80 percent of the inhabitants subsist on agriculture and thus are considered very vulnerable and poor, with unstable incomes. The remaining minority is engaged either in small businesses or in the army. During the Lebanese war, for security reasons, the majority of the Christians left the village for safer areas. The village is poor in its supply of water. As one of the consequences of the civil war in 1976, the major source of water to Al Qaa coming from the Shiite village of Labweh was cut. CNEWA assisted in rehabilitating the village artesian well in 2013. Due to the intense presence of Syrian refugees presently living in the village of Al Qaa — around 20,000, compared to 140 Christian families — the water supply represents a serious challenge to the local community, especially for irrigation. CNEWA is coordinating with the Melkite Greek Catholic parish priest of Al Qaa, the Rev. Elian Nasrallah, and has spoken to him this morning, ensuring that he was safe. Father Elian Nasrallah, a good friend of CNEWA and a long time partner in several projects, is not only an active priest of 28 years in his remote parish in Al Qaa, but also has been very vigorous and creative in finding ways to improve the educational growth and social development of his parishioners. What Father Nasrallah has been doing in his parish is a work of mercy. In his poor community, he keeps the youngsters off the streets and in schools, teaches them different skills, entertains them with music, theatre and sports activities, strengthens their spiritual lives and allows them to have fun, all the while providing impoverished families access to health services. Since the 80’s, Father Elian has worked to create a stronger Christian community in a neglected region surrounded by a Muslim majority, where no economic, educational or health opportunities are available. In the village’s multipurpose hall, the father used to gather youth and provide activities — computer skills; technical formation; art, theater and music classes, including a choir; sports activities; summer camps; spiritual formation; and various other activities. He also provides the existing families with access to health services through the village dispensary, supported by CNEWA. Following the huge influx of Syrians finding shelter in the village, and through funds from CNEWA’s generous donors, the father was able to extend his hands to the poor refugees and has provided them with basic emergency aid, including blankets, mattresses, food packages, fuel for heating, medical support and even education to young Syrian children. 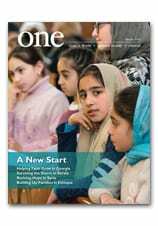 Read more about the flight of Syrian refugees to Al Qaa in Crossing the Border from the Spring 2013 edition of ONE. As part of his pastoral visit to the United States, Bechara Peter Cardinal Rai, Maronite Catholic Patriarch of Antioch, visited CNEWA’s New York offices Monday for a series of events that underscored the challenges Lebanon is facing today. The patriarch’s schedule included delivering an important statement on “the present situation and future prospects” of Christians in the Middle East, a news conference, personal interviews, meetings, and an interfaith luncheon — all held at CNEWA’s New York headquarters on First Ave. The patriarch was greeted by CNEWA’s chair, New York Archbishop Cardinal Timothy Dolan, who welcomed him to the New York Catholic Center. After exchanging greetings, CNEWA’s president Msgr. John E. Kozar accompanied him to CNEWA’s board room, where the patriarch held a news conference to discuss developments in the Middle East. Msgr. John E. Kozar introduces the patriarch and his staff to reporters and CNEWA staff. The patriarch took pains to emphasize the rich history shared by Christians and Muslims in the Middle East, and the vital role Christianity has played there across the centuries. But he also took note of continued turmoil in the region — civil war, terrorism, widespread displacement and a growing number of refugees — and called for just and lasting solutions. After taking questions from the gathered reporters, and elaborating on his statement, the patriarch attended a small luncheon, featuring some two dozen interfaith and ecumenical leaders — and a few familiar faces, including an old friend, CNEWA’s President Emeritus, Msgr. Robert Stern. This marked his first visit to CNEWA in five years — and it had great meaning not only for us, but for others working for peace in the world we serve. The patriarch is scheduled to be in the United States until 10 July. His visit includes stops in a number of Maronite Catholic communities and parishes throughout the eparchies, or dioceses, of St. Maron of Brooklyn and Our Lady of Lebanon of Los Angeles. We hope he returns soon!